An uplifting blend of Australian mandarin and lime peel essential oils create a sweet and sour delight to awaken the senses and provide a truly refreshing cleanse for the whole family. Coconut milk helps to nourish skin, providing a silky smooth base from which to lather up with. Ingredients: saponified olive oil, coconut oil, shea butter, coconut milk, sunflower oil,macadamia oil, castor oil, rice bran oil, pure essential oils of mandarin, lime peel, bergamot, cedarwood, orange and tangerine, annatto, clay. Order 10 or more boxed soaps to receive a 21% discount. Enter the code word 'bulk boxed' at checkout for discount to apply. 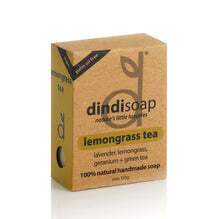 Excludes boxed white sage soap and already discounted goats milk, hempseed + olive oil soaps.